The 2014 Italian Grand Prix (formally the Formula 1 Gran Premio d'Italia 2014) was a Formula One motor race held on 7 September at the Autodromo Nazionale Monza in Monza, Lombardy. It was the 13th round of the 2014 Formula One season and the 65th running of the event held as part of the Formula One World Championship. The 53-lap race was won by Mercedes driver Lewis Hamilton after starting from pole position. His teammate Nico Rosberg finished second and Williams driver Felipe Massa came in third. It was Hamilton's sixth victory of the season, his second at Monza, and the 28th of his career. Hamilton won the pole position by posting the fastest lap in qualifying but made a slow start off the line, allowing Rosberg to move into the lead heading into the first turn. He moved back into second by the tenth lap upon passing Massa and Kevin Magnussen. Hamilton drew closer to teammate Rosberg and remained in second after the round of pit stops. He was instructed over his radio to remain at least two and a half seconds behind Rosberg but opted to ignore the message and took over the lead on lap 29 when Rosberg went off the track at the first chicane. Hamilton maintained the lead for the remainder of the race to secure the victory. There were three lead changes among two different drivers during the course of the race. The result meant Hamilton reduced Rosberg's lead in the Drivers' Championship to 22 points with Daniel Ricciardo consolidating his hold over third position. Valtteri Bottas moved into fourth position while Fernando Alonso did not finish the race and fell to fifth. Mercedes increased their advantage in the Constructors' Championship to hold a 182-point lead over the second-placed Red Bull. Williams's strong result enabled the team to move into third place and demote Ferrari one position to fourth with six races left in the season. The Autodromo Nazionale Monza, where the race was held. The 2014 Italian Grand Prix was the 13th of 19 scheduled rounds of the 2014 Formula One season, and the 65th running of the event as part of the Formula One World Championship. It was held on 7 September at the 5.793-kilometre (3.600 mi) eleven-turn Autodromo Nazionale Monza in Monza, Lombardy. The drag reduction system (DRS) had two activation zones for the race: one was on the straight between the second Lesmo corner and the Ascari chicane, and the second was on the start/finish straight linking Parabolica to the Rettifilo chicane. Tyre supplier Pirelli brought two types of tyre to the race: two dry compounds (medium "options" and hard "primes"). The medium tyres were identified by a white stripe on their side-walls, and the hard tyres were similarly identified in orange. Before the race Mercedes driver Nico Rosberg led the Drivers' Championship with 220 points, ahead of teammate Lewis Hamilton in second and Daniel Ricciardo in third. Fernando Alonso was fourth on 121 points and Valtteri Bottas was a further eleven points behind in the battle for the position. Mercedes were leading the Constructors' Championship with 411 points, and Red Bull were second on 254 points. Ferrari (160 points) and Williams (150) contended for third place and McLaren rounded out the top five on 105 points. Following the collision between Hamilton and Rosberg on the second lap at the preceding Belgian Grand Prix, the third such controversial incident surrounding the Mercedes team during the season which stretched back to qualifying for the Monaco Grand Prix when Rosberg was accused of spoiling Hamilton's lap, the Mercedes team principal Toto Wolff threatened sanctions against one of their drivers in the event a similar situation occurred and insisted that both drivers were obligated to serve the team's interests. Hamilton said his objective for Monza was to regain some of the lost ground in the Drivers' Championship and he would not cede the challenge until the season-closing round in Abu Dhabi: "It's as big as it's been all season so I've got a lot of work ahead of me but anything can happen in this sport." Rosberg was aware of his situation in the title battle and was confident of achieving a strong result: "I'm focused on taking the maximum points possible in the remaining seven races and I know the team is too, starting with a top result this weekend." Kamui Kobayashi (pictured in 2010) returned to Caterham after missing the Belgian Grand Prix. The Parabolica corner was altered ahead of the race weekend, with a large portion of the turn's gravel trap removed and replaced with an asphalt run-off area. It was reported that the alteration was made ahead of a possible return of the Superbike World Championship in 2015 after series officials raised concerns about the lack of run-off areas on the circuit. The change was heavily criticised by the sport's fan base on social media and certain drivers who felt it removed part of the challenge from Parabolica. The Fédération Internationale de l'Automobile race director Charlie Whiting, however, defended the changes, revealing that drivers and the sport's governing body asked for alterations to be made for safety reasons but acknowledging that the turn might not provide as much of a challenge as it previously had. Others joined in Whiting's defence, including Romain Grosjean, who believed the gravel trap's removal would enable drivers to find their limit more quickly because of the lack of fear of a large accident in the event of problems. There was one driver change heading into the race. Having driven in one of the two Caterham cars in place of regular driver Kamui Kobayashi at the preceding Belgian Grand Prix, three-time 24 Hours of Le Mans winner and 2011 Formula Nippon champion André Lotterer returned to the latter series and Kobayashi retook his race seat. Lotterer planned to compete at Monza but following the decision made by Caterham team principal Colin Kolles to run Formula Renault 3.5 Series driver Roberto Merhi in the first practice session, he opted not to return. He explained to the press that because of his "rookie" driver status, he needed the maximum amount of on-track time he could receive. Kobayashi said he was looking forward to testing updates to the CT05 chassis and that he had no doubts over the team's decision to change drivers: "I always enjoy the Italian GP, not only because of its high-speed nature; I also like the Italian fans, they are always very enthusiastic and a very big part of the Italian GP weekend. They also create a very special atmosphere." Lotus reserve driver Charles Pic replaced Grosjean for the first free practice session for the first time in the season. Deutsche Tourenwagen Masters driver Daniel Juncadella made an appearance in Pérez's Force India for the session's first half hour, and Giedo van der Garde drove Adrian Sutil's Sauber. Three practice sessions—two on Friday and a third on Saturday—were held before the Sunday race. The Friday morning and afternoon sessions lasted ninety minutes each; the third, one-hour session was held on Saturday morning. In the first practice session, which took place in dry and sunny weather conditions, Hamilton was fastest with a time of one minute and 26.187 seconds, six-tenths of a second faster than Jenson Button in second, who held the fastest time until Hamilton's lap, and Rosberg third. Alonso was fourth-fastest, ahead of Kevin Magnussen in fifth and Vettel sixth. Kimi Räikkönen, Sergio Pérez, Daniil Kvyat and Nico Hülkenberg rounded out the session's top-ten drivers. During the session several drivers noted the hard compound tyres took longer than anticipated to reach their optimum working temperature, and multiple drivers went off the track while acquainting themselves with their low-downforce set-ups. Ricciardo had trouble with his DRS and his session ended early when he entered the pit lane with a suspected energy recovery system problem, and Magnussen struggled with rear-braking issues. Rosberg set the fastest lap of the second practice session at one minute and 26.225 seconds; Hamilton was 0.061 seconds behind in second despite remaining in his garage for an hour for electrical repairs, and Räikkönen was third. His teammate Alonso was fourth-fastest, with Bottas fifth and Button sixth. Vettel (who ran wide at Parabolica corner on his fastest lap), Magnussen, Massa and Ricciardo followed in the top ten. Multiple drivers went off the track during the session and both Lotus cars of Grosjean and Maldonado struggled to generate heat into their tyres and had further difficulty with braking stability and the ability to steer into corners. In the third practice session, which was held in warmer and sunnier weather conditions, Hamilton set the fastest lap of the weekend so far at one minute and 25.519 seconds, ahead of Alonso in second and Bottas third. His teammate Massa was fourth-fastest; Button was fifth and Vettel sixth. Räikkonen was seventh-fastest, Kvyat eighth, Ricciardo ninth and Hülkenberg completed the top ten ahead of qualifying. Rosberg was affected by gearbox problems, forcing him to abandon his short run programme early. It reoccurred when he next emerged on track, causing him to prematurely end his session. Lewis Hamilton had the 36th pole position of his career, and took his sixth victory of the season the following day. Saturday afternoon's qualifying session was divided into three parts. The first part ran for 18 minutes, eliminating cars that finished the session 17th or below. The 107% rule was in effect, requiring drivers to reach a time within 107% of the quickest lap to qualify. The second part of the qualifying session lasted 15 minutes, eliminating cars that finished 11th to 16th. The final part of the qualifying session determined first to tenth, deciding the pole position. Cars in the final qualifying session were not allowed to change tyres, using the tyres with which they set their quickest lap times. Qualifying took place in warm weather conditions. Hamilton set the fastest laps in all three sessions to clinch his fifth pole position of the season, the 36th of his career, and his first since the Spanish Grand Prix with a time of one minute and 24.109 seconds. He was joined on the grid's front row by Rosberg (running with a repaired gearbox) who recorded a lap 0.274 seconds slower than his teammate having improved on his first timed lap, but oversteered through the Ascari chicane, preventing him from achieving the pole position. The two Williams cars lined up in third and fourth (with Bottas ahead of Massa) and both drivers were unable to improve their fastest times on their second attempts. They were ahead of both McLaren drivers on the grid's third row with Magnussen faster than teammate Button; the latter lost time through the Lesmo corners on his final timed lap. Alonso was slightly slower than Vettel after his first run on the circuit, but improved slightly to secure seventh. He attributed his starting position to recording similar lap times on four sets of tyres. Vettel out-qualified teammate Ricciardo for the fourth time in the past six races to secure eighth. Ricciardo started ninth. Pérez rounded out the top-ten qualifiers. Kvyat was the fastest driver not to advance into the final qualifying session; his fastest time of one minute and 26.070 seconds was one and a half seconds off Hamilton's pace in the second session. However, he received a ten-place grid penalty for changing his engine overnight, his sixth of the season. Hence, Räikkonen moved into eleventh. Räikkonen struggled with car grip and locked his front tyres, abandoning his first timed lap because cars leaving the pit lane hindered his visibility entering the Rettifilo chicane. After preparing for his second attempt, he locked his right-front wheel and ran into the run-off area. Jean-Éric Vergne started from 12th with Hülkenberg unable to match his teammate's pace in 13th because he was delayed by slower traffic while preparing for his lap at Parabolica and felt his car was loose. Sutil had problems driving but gradually improved his car's balance as he circled the track, and improved on his final lap to secure 14th, ahead of teammate Esteban Gutiérrez who made a slight error on his final lap. Maldonado failed to advance beyond the first qualifying session, with teammate Grosjean managing five laps after missing the opening 13 minutes while his team repaired a fluid leak discovered before qualifying. Kobayashi slipstreamed teammate Marcus Ericsson to move ahead of Jules Bianchi for 18th, with Bianchi not improving as he slid sideways through the Ascari chicane and other drivers set faster lap times on the medium compound tyres. His teammate Max Chilton qualified 20th and Ericsson completed the field in 22nd; the latter was hindered due to a lack of decent running on the medium compound tyres following an engine problem in the third practice session. ^1 — Daniil Kvyat qualified in eleventh but was given a ten-place grid penalty for using his sixth engine of the season. Weather conditions at the start of the race were dry and sunny. The air temperature was 25 °C (77 °F) and the track temperature throughout ranged from 37 to 42 °C (99 to 108 °F). A cooler on Hamilton's right-front wheel became detached and crunched on his car's front wing, causing Mercedes to push his car to his starting position upon arriving on the start/finish lap following his reconnaissance lap. The problem was inspected and determined that it was not a major problem. Unlike previous years when softer tyre compounds were selected, a one pit stop strategy was calculated to be faster than a two-pit stop strategy by around 12 seconds. Ericsson was ordered to begin the race from the pit lane after being penalised for driving too fast under double waved yellow flag conditions in the third practice session. When the race began from its standing start at 14:00 Central European Summer Time (UTC+02:00), Hamilton's car remained in race start mode, dropping him to fourth and enabling Rosberg to move into the lead into the Rettifilo chicane. Bottas had wheelspin off the line, dropping to eleventh. Magnussen passed Massa around the outside for second place going into the Rettifilo chicane. Pérez accelerated faster than Alonso off the line and was ahead of him before Alonso retook the position around the outside at Curva Grande corner. Nico Rosberg led 26 of the first 29 laps before locking his tyres and running off the track, prompting Hamilton to take over the lead. Vettel made a good start, moving to fifth by the end of the first lap but his teammate Ricciardo was forced wide onto the chicane's run-off area, dropping four positions over the same distance. Massa attempted to take over second place from Magnussen by braking later than he did at the start of lap two while Rosberg pulled away from the two drivers. Magnssen went wide at Curva Grande corner and fended off another overtaking manoeuvre from Massa. DRS was enabled on the next lap and Hamilton used it to attack Massa, allowing Magnussen to pull away from the latter. After starting 21st, Kvyat passed both Marussia drivers and Kobayashi to run in 17th. Magnussen continued to defend, but in doing so, ran deep entering the Rettifilo chicane, causing Massa to slipstream the McLaren driving towards the Variante della Roggia chicane and overtook him around the outside to claim second. Magnussen entered the turn off the racing line, spun his tyres leaving the corner, enabling Hamilton to gain the advantage by accelerating faster than Magnussen and passed him for third going into the first Lesmo corner. Massa and Hamilton pulled away from Magnussen who was being caught by a group consisting of Vettel, Button, Alonso and Pérez. Hülkenberg lost ninth to Räikkonen on the same lap and Bottas attempted to gain an advantage at Parabolica corner but no space was available to attempt a passing manoeuvre. Bottas did however overtake Hülkenberg for tenth at the Rettifilo chicane. Chilton entered the Variante della Roggia chicane too fast on lap six, and hit the second set of kerbs at the corner, launching his car airborne and sending him straight into the barrier, ending his race. The safety car was not needed. Rosberg held an advantage of nearly four seconds by the end of the lap and he moved his brake bias towards the front of his car. Kvyat continued to gain positions by passing Gutiérrez and Sutil for 15th by the eighth lap. As Massa increased his pace Rosberg did the same in response. On the following lap, Rosberg locked his tyres driving towards the Rettifilo chicane at 206 miles per hour (332 km/h) and went down the corner's escape road and slalomed through the turn's obstacles. He remained the leader, although his lead over Massa was lowered to two seconds. Hamilton used DRS and steered onto the outside line going into the Rettifilo chicane and passed Massa for second place on the tenth lap. Bianchi made wheel to wheel contact three times with Grosjean at the same turn two laps later with Grosjean passing Bianchi's car. Up front, Hamilton began drawing closer to Rosberg but required a further few laps to pull clear from Massa and thus did not attack Rosberg and stayed out of his teammate's slipstream, nursed his tyres and minimised his fuel usage. Bottas overtook Räikkönen for ninth on lap 13; that lap, he closed up to Pérez and slipstreamed the Force India, moving into ninth by passing him around the outside entering the Rettifilo chicane. Alonso steered onto the inside line to defend from the faster Bottas but the latter overtook him for seventh on the start/finish straight on lap 16. Two laps later, Bottas continued to gain positions by getting past Button around the outside for sixth. Red Bull elected to bring Vettel into the pit lane at the end of the same lap for hard compound tyres in an effort to undercut Magnussen rather than battle with Bottas. Pérez followed in response on the following lap. Bottas pressured Magnussen and passed him for fourth at the Rettifilo chicane on lap 21. Magnussen and Alonso made their pit stops on the next lap, rejoining in ninth and eleventh, behind Vettel and Pérez separated them. Magnussen attempted to pass Pérez at the Variante della Roggia chicane but slid leaving the turn. Massa made his pit stop from third on lap 24, and emerged in fifth. Hamilton received instructions for an engine mode change and Rosberg entered the pit lane from the lead on the next lap and handed the lead to Hamilton. Bottas made his stop on the same lap and rejoined alongside Vettel on the start/finish straight but was forced wide, allowing Magnussen to pass him. Hamilton took his pit stop on the 26th lap and handed back first to teammate Rosberg. Bottas also fell behind Pérez but re-passed the latter going into the Rettifilo chicane. Hamilton's race engineer Peter Bonnington told him over the radio to remain at least two and a half seconds behind teammate Rosberg and conserve tyre life for an attack in the closing laps. Hamilton was aware from previous experiences earlier in the season that the method to pass a driver was to do so when tyre grip was optimal otherwise it would not have been possible to draw close enough to effect a passing manoeuvre. He recorded the fastest lap of the race at that point to move within seven-tenths of a second behind teammate Rosberg by the start of lap 28, causing debate among Mercedes pit lane employees. Massa at this point was twelve seconds in arrears and Hamilton was granted permission by Bonnington to attack earlier than planned. Rosberg's front brake temperatures overheated and his attempt to conserve his rear tyres by moving his brake bias towards the front of his car compromised them. Hamilton used DRS and as Rosberg applied his brakes, he drove straight into the Rettifilo chicane's run-off area and slalomed his way through the obstacles, enabling Hamilton to gain the lead. Alonso's energy recovery system failed which triggered a complete electrical shutdown half a minute later; he pulled over to the side of the track and into Rettifilo's run-off area to retire for the first time in the season. Button attempted to move past Pérez driving into the Rettifilo chicane but was unable to get ahead and the two narrowly avoided contact. Bottas made an passing attempt on Magnussen entering the same turn but Magnussen drove defensively, forcing Bottas to cut the chicane on lap 32. On the 33rd lap, Ricciardo overtook Räikkönen for ninth by going around the inside of him entering the Rettifilo chicane and out-braked him. Hamilton began to pull away from Rosberg, leading his teammate by 4.3 seconds by the start of lap 36. Bottas moved to the outside line heading into the Rettifilo chicane on the following lap and Magnussen responded by steering towards the inside line, causing Bottas to mount the kerbing to avoid a collision, though he succeeded in passing the McLaren car. Shortly afterwards, Magnussen was handed a five-second stop-and-go penalty by the stewards for his role in forcing Bottas off the track in the latter's earlier overtaking attempt. Button passed Pérez around the inside driving into the Rettifilo chicane for seventh on lap 39, but Pérez responded by going alongside Button through the Curva Grande corner and the Variante della Roggia chicane. Pérez was forced wide onto the Variante della Roggia chicane kerbing but took the inside line and regained seventh place from Button at the Curva di Lesmo turns. On the following lap, Bottas passed Vettel to move into fourth at the Rettifilo chicane and his teammate Ricciardo overtook Button for seventh at the same turn. Ricciardo drew close to Pérez and pressured him into locking his brakes entering the Rettifilo chicane. He achieved a good rhythm through the Curva Grande corner, and moved lanes, passing Pérez around the outside to take over seventh at the Variante della Roggia chicane on lap 41. Felipe Massa finished third to secure his first podium result since the 2013 Spanish Grand Prix. Button initiated a second attack at Pérez and passed him entering the Rettifilo chicane but was slow leaving the turn after locking his tyres, enabling Pérez to fight back and regain eighth by forcing Button wide heading into the Variante della Roggia chicane. Ricciardo caught Magnussen and passed him around the outside at the Rettifilo chicane to take over sixth place on lap 45 despite locking his tyres and drifting sideways. Ricciardo received a message to chase his teammate Vettel and attempted to overtake him around the outside entering the Rettifilo chicane on lap 47 with Vettel defending fifth place but the latter was slow leaving the turn. Both drivers went alongside each other through the Curva Grande corner and Ricciardo turned to the inside line and overtook Vettel for fifth place at the Variante della Roggia chicane. Hülkenberg lost eleventh position to Kvyat on the same lap and began drawing closer to Räikkönen. Gutiérrez had brake problems and made contact with Grosjean at the Rettifilo chicane on the 51st lap, puncturing the Sauber's right-rear tyre, and was forced to drive slowly back to the pit lane. Kvyat's brakes failed on lap 52, causing him to turn left to avoid hitting Räikkönen. He went onto the grass at the Rettifilo chicane, clipping a polystyrene marker and rejoined the track. Hamilton maintained the lead and crossed the start/finish line after 53 laps to win the race. Rosberg finished second, 3.1 seconds behind, with Massa securing his first podium result of the season in third, his first since the 2013 Spanish Grand Prix. Bottas took fourth, ahead of both Red Bull drivers Ricciardo and Vettel in fifth and sixth. Pérez, Button and Räikkönen finished in positions seven to nine and Magnussen rounded out the top ten points-scoring positions after his five-second time penalty was applied. Kvyat, Hülkenberg, Vergne, Maldonado and Sutil filled the next five places with Kobayashi and Bianchi in the next two places. Gutiérrez finished 19th on the road with Ericsson the last of the classified finishers. It was Hamilton's sixth victory of the season, his second at Monza, and the 28th of his career. There were three lead changes in the race; two drivers reached the front of the field. Hamilton led twice for a total of 27 laps, more than any other competitor. At the podium ceremony following the race, Rosberg was booed by the crowd, mirroring a similar incident towards him at the previous race in Belgium for his clash with Hamilton, which was the catalyst for their displeasure. Hamilton later told the press that he did not feel comfortable about the fans behaving in such a manner: "I've had it here, years and years ago, and it's great personally for me to have such great support, from the Ferrari fans and the Mercedes fans. But when I was up there, it was awkward for me to hear them booing Nico because I just don't like that in sport." Wolff affirmed that booing should not be heard on the podium but acknowledged Formula One is an emotional sport for its fans while also saying: "It's a sport and sport should unite." When asked about the booing in the press conference, Rosberg replied while it was "not nice" he hoped over time the fans would forgive him for his past actions. In the podium interviews, conducted by former driver Jean Alesi, Massa expressed his happiness over finishing third and was certain luck was beside him and that there was "a lot more to come." Toto Wolff denied theories that Rosberg's race-lead mistake on the 29th lap was deliberate. In the hours following the race, conspiracy theories emerged on social media around the circumstances of Rosberg losing the lead to Hamilton on lap 29. They suggested the incident was an act of revenge for the collision between Rosberg and Hamilton at the Belgian Grand Prix two weeks prior. Three-time world champion Jackie Stewart felt the move was "a bit too easy" and appeared to indicate the error was done purposely: "I thought [Rosberg] could have least made an effort to get round the corner. I first thought 'that's wise', because he knew it wasn't a difficult thing to believe; the second time I thought: 'Hello, what's going on here?'" Wolff denied the allegations that the mistake was deliberate, suggesting Rosberg was under pressure because of the Drivers' Championship battle but admitted it was not common for Rosberg to perform the same error twice: "Only a paranoid mind could come up with such an idea." Rosberg responded by stating Hamilton's fast pace prompted him to push hard. He said while he could have successfully executed the corner, there was a large probability of flat-spotting one of his tyres and driving onto the run-off area was the safer choice. He stated he had heard about the theory but that there was "no possible reason" for him to purposely run off the track. Television pictures apparently showed Wolff smiling moments after Rosberg's error. Wolff asserted that the broadcast was not live and stated the transmission of pit-to-car radio about Hamilton reducing his pace to conserve tyre life for a late race attack did not indicate a true picture of events. Gutiérrez was handed a twenty-second time penalty since the stewards judged him to have been responsible for the collision between himself and Grosjean which punctured the Sauber's right-rear tyre although they accepted the view he had brake problems. Gutiérrez stated his brake problems had appeared in "an inconsistency that sometimes you cannot predict". and that while he did not move lines purposefully, the contact with Grosjean was "an unfortunate moment." Sauber team principal Monisha Kaltenborn deemed the incident "unnecessary" and Grosjean said he was not sure as to what happened with Gutiérrez. Concerning Bottas's poor start that dropped him down the field, Williams performance chief Rob Smedley announced the team were investigating the problem and revealed they originally believed it was a clutch-related issue. Bottas stated he felt he was too assertive with his clutch and his race was hindered when he was unable to accelerate with the normal amount of speed leaving the chicane: "The start on the formation lap – when we always do the final checks – was a bit compromised because Lewis had a slow getaway, so that maybe hurt a little bit. But definitely the tyres were not in the optimum window." Alonso was convinced he could have finished fifth had his car not stopped with an energy recovery system failure, saying he felt the car was quicker than Ricciardo's Red Bull and revealed his team changed their approach, prompting him to slow after his problem emerged. He stated the remainder of the season was "not going to be too different" after enduring a difficult campaign over the past twelve rounds but that Ferrari was prepared: "It is the way at the moment but we cannot do anymore than this." Bottas told the press after the race that Magnussen's driving was "on the limit" but was not sure whether his rival deserved a penalty. Magnussen was "frustrated" upon receiving his second consecutive time-penalty and stated he would review the incident and carry over lessons into the next race of the season. While initial reactions in the United Kingdom disagreed with the stewards decision, Smedley felt the penalty was justified. Red Bull team principal Christian Horner reserved praise for Ricciardo, feeling his overtaking manoeuvres were "truly impressive" and that this skill was one of the driver's strengths: "For somebody that had a question mark over his overtaking coming into the year, he [has shown it] is right up there with the best." The result meant Hamilton lowered Rosberg's lead at the top of the Drivers' Championship to 22 points, with Ricciardo consolidating third place on 166 points. With his fourth-place result Bottas moved ahead of the non-finishing Alonso to take over fourth in the standings and the Ferrari driver fell to fifth. Mercedes further extended their advantage in the Constructors' Championship to hold a 182-point lead over the second-placed Red Bull. Williams's strong result enabled them to move into third place and demoted Ferrari to fourth position, five points behind the team. McLaren rounded out the top five with 110 points with six races left in the season. ^1 — Kevin Magnussen finished in seventh but had five seconds added to race time for forcing Valtteri Bottas off the track. ^2 — Marcus Ericsson started from pit lane for yellow flag infringement during the third practice session. ^3 — Esteban Gutiérrez finished in nineteenth but had twenty seconds added to race time for causing an avoidable collision to Romain Grosjean. Bold text indicates competitors who still had a theoretical chance of becoming World Champion. ^ "2014 Italian Grand Prix – Preview". Fédération Internationale de l'Automobile. 3 September 2014. Archived from the original on 28 December 2016. Retrieved 13 June 2017. ^ "Two DRS zones retained for Monza". GPUpdate. 2 September 2014. Archived from the original on 5 September 2014. Retrieved 13 June 2017. ^ Codling, Stuart. "Italian Grand Prix stats". F1 Racing. Haymarket Publications. November 2014 (225): 106. ^ Pugmire, Jerome (24 August 2014). "F1: Mercedes tensions flare between Rosberg, Hamilton after crash". Toronto Star. Associated Press. Archived from the original on 15 September 2014. Retrieved 13 June 2017. ^ "Mercedes rivals ready for a fresh start at Italian GP". Gulf News. 5 September 2014. Retrieved 13 June 2017. ^ Dampf, Andrew (3 September 2014). "Rosberg-Hamilton duel returns to roots at Monza". Associated Press. Archived from the original on 16 June 2017. Retrieved 13 June 2017. ^ "Alonso plays up Mercedes feud". Irish Examiner. 3 September 2014. Archived from the original on 6 September 2014. Retrieved 13 June 2017. ^ "Monza's Parabolica gravel trap replaced with tarmac". ESPN. 7 August 2014. Archived from the original on 10 August 2014. Retrieved 13 June 2017. ^ a b Wise, Mike (1 September 2014). "FIA insists run-off added to famous Parabolica corner is necessary". Sky Sports F1. Archived from the original on 30 March 2015. Retrieved 13 June 2017. ^ a b Noble, Jonathan (1 September 2014). "FIA defends changes to Parabolica run-off ahead of F1 Italian GP". Autosport. Archived from the original on 2 September 2014. Retrieved 13 June 2017. ^ Baldwin, Alan (4 September 2014). "Kobayashi back for Monza but future uncertain". Reuters. Archived from the original on 16 June 2017. Retrieved 13 June 2017. ^ DeGroot, Nick (4 September 2014). "Lotterer refuses to drive for Caterham at Monza". motorsport.com. Archived from the original on 8 September 2014. Retrieved 13 June 2017. 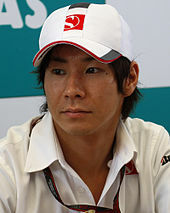 ^ "F1 Italian Grand Prix: Kobayashi returns for Caterham at Monza". crash.net. 4 September 2014. Archived from the original on 14 September 2014. Retrieved 13 June 2017. ^ Anderson, Ben (5 September 2014). "Italian GP: Charles Pic replaces Romain Grosjean at Lotus for FP1". Autosport. Archived from the original on 8 September 2014. Retrieved 13 June 2017. ^ a b Galloway, James (5 September 2014). "2014 Italian GP Practice One: Lewis Hamilton makes flying start at Monza". Sky Sports F1. Archived from the original on 16 June 2017. Retrieved 13 June 2017. ^ a b c Codling, Stuart (5 September 2014). "Italian GP: Lewis Hamilton leads Jenson Button in first practice". Autosport. Archived from the original on 7 September 2014. Retrieved 13 June 2017. ^ "Hamilton fastest in opening Monza practice". GPUpdate. 5 September 2014. Archived from the original on 18 March 2015. Retrieved 14 June 2017. ^ Parkes, Ian (5 September 2014). "F1 Italian Grand Prix 2014: Normal service resumes as Nico Rosberg and Lewis Hamilton fill top two spots". The Independent. Press Association. Archived from the original on 16 June 2017. Retrieved 14 June 2017. ^ Straw, Edd (5 September 2014). "Italian GP practice: Nico Rosberg leads Lewis Hamilton in FP2". Autosport. Archived from the original on 6 September 2014. Retrieved 14 June 2017. ^ Esler, William (6 September 2014). "2014 Italian GP Practice Two: Nico Rosberg fastest as Lewis Hamilton hits issues". Sky Sports F1. Archived from the original on 16 June 2017. Retrieved 14 June 2017. ^ Codling, Stuart (6 September 2014). "Italian GP: Lewis Hamilton tops practice, problems for Nico Rosberg". Autosport. Archived from the original on 8 September 2014. Retrieved 14 June 2017. ^ a b c "Lewis Hamilton on pole for Italian Grand Prix ahead of Mercedes team-mate Nico Rosberg". ABC News. Agence France-Presse. 6 September 2014. Archived from the original on 1 November 2016. Retrieved 14 June 2017. ^ a b c d Benson, Andrew (6 September 2014). "Italian GP: Lewis Hamilton takes pole ahead of Nico Rosberg". BBC Sport. Archived from the original on 16 June 2017. Retrieved 14 June 2017. ^ a b c d e f g h i j k l m n o p q r s t u v w Hughes, Mark (7 September 2014). "2014 Italian GP report". Motor Sport. Archived from the original on 25 September 2014. Retrieved 14 June 2017. ^ a b c d e f Straw, Edd (6 September 2014). "Italian GP: Lewis Hamilton takes commanding Monza pole for Mercedes". Autosport. Archived from the original on 7 September 2014. Retrieved 14 June 2017. ^ a b c d "Who said what after qualifying for the Italian Grand Prix". ESPN. 6 September 2014. Archived from the original on 16 June 2017. Retrieved 14 June 2017. ^ a b c "2014 Italian Grand Prix – Qualifying". Formula1.com. Archived from the original on 6 September 2014. Retrieved 27 December 2015. ^ a b Matar, Daniella (6 September 2014). "Bottas looking to challenge Mercedes at Monza". The San Diego Union-Tribune. Associated Press. Archived from the original on 16 June 2017. Retrieved 14 June 2017. ^ "Hamilton beats Rosberg to Monza pole". GPUpdate. 6 September 2014. Archived from the original on 10 March 2016. Retrieved 14 June 2017. ^ a b c Groves, Jordan (6 September 2014). "Formula One: Hamilton defeats qualifying demons to take Italian pole!". RTR Sports. Archived from the original on 30 June 2015. Retrieved 14 June 2017. ^ "GP Italien in Monza / Rennen". motorsport-total.com. Archived from the original on 10 September 2014. Retrieved 14 June 2017. ^ a b c d e f g h i j k l m n o p q r s t u v w Elizade, Pablo; Beer, Matt; Noble, Jonathan; Bradley, Charles; Cross, Dan (7 September 2014). "As it happened: Sunday – Italian Grand Prix". Autosport. Archived from the original on 10 September 2014. Retrieved 14 June 2017. ^ a b Collantine, Keith (6 September 2014). "Ericsson to start from pits after penalty". F1 Fanatic. Archived from the original on 12 March 2016. Retrieved 15 June 2017. ^ Medland, Chris (7 September 2014). "F1 Italian Grand Prix: Hamilton recovers to win after Rosberg error". crash.net. Archived from the original on 9 August 2016. Retrieved 14 June 2017. ^ a b c d e f g h i j k l m n o p q r s Barretto, Lawrence (7 September 2014). "Lewis Hamilton wins Italian Grand Prix – As it happened". BBC Sport. Archived from the original on 10 September 2014. Retrieved 14 June 2017. ^ a b c de Menzes, Jack (7 September 2014). "F1 Italian Grand Prix – LIVE". The Independent. p. 1. Archived from the original on 8 September 2015. Retrieved 15 June 2017. ^ a b c d e Bagchi, Rob (7 September 2014). "Italian Grand Prix 2014: as it happened". The Sunday Telegraph. Archived from the original on 17 April 2016. Retrieved 14 June 2017. ^ a b c d e f g de Menzes, Jack (7 September 2014). "F1 Italian Grand Prix – LIVE". The Independent. p. 2. Archived from the original on 13 September 2014. Retrieved 15 June 2017. ^ a b c d e Anderson, Ben; Elizade, Pablo (7 September 2014). "Italian GP: Esteban Gutierrez penalised for Romain Grosjean clash". Autosport. Archived from the original on 8 September 2014. Retrieved 15 June 2017. ^ a b c "2014 Grand Prix of Italy". Racing-Reference. Archived from the original on 16 June 2017. Retrieved 13 June 2017. ^ Damph, Andrew (7 September 2014). "Hamilton wins at Monza as Rosberg cracks". The Brownsville Herald. Associated Press. Archived from the original on 16 June 2017. Retrieved 16 June 2017. ^ a b Larson, Mike (10 September 2014). "Hamilton defends Mercedes teammate Nico Rosberg against booing fans". Autoweek. Archived from the original on 8 September 2015. Retrieved 16 June 2017. ^ a b Gill, Pete (9 September 2014). "Lewis Hamilton admits he found the booing of Nico Rosberg on Monza podium 'awkward'". Sky Sports F1. Archived from the original on 16 June 2017. Retrieved 16 June 2017. ^ "Italian GP: Post-race press conference". Autosport. 7 September 2014. Archived from the original on 8 September 2014. Retrieved 16 June 2017. ^ a b Benson, Andrew (8 September 2014). "Lewis Hamilton: Nico Rosberg not ordered to gift race – Toto Wolff". BBC Sport. Archived from the original on 10 September 2014. Retrieved 16 June 2017. ^ Muthanna, Pradhan (9 September 2014). "Mercedes F1 Boss Toto Wolff Vehemently Denies Race Fixing Claims". International Business Times. Archived from the original on 11 September 2014. Retrieved 16 June 2017. ^ Weaver, Paul (7 September 2014). "Mercedes: claims Nico Rosberg made mistakes deliberately are 'paranoid'". The Guardian. Archived from the original on 1 December 2014. Retrieved 16 June 2017. ^ Noble, Jonathan (9 September 2014). "Mercedes F1 boss Toto Wolff denies smiling after Nico Rosberg error". Autosport. Archived from the original on 11 September 2014. Retrieved 16 June 2017. ^ Noble, Jonathan (7 September 2014). "Italian GP: Williams team investigating Valtteri Bottas's start woe". Autosport. Archived from the original on 8 September 2014. Retrieved 16 June 2017. ^ Medland, Chris (7 September 2014). "F1 Italian Grand Prix: Bottas felt victory was realistic target". crash.net. Archived from the original on 9 August 2016. Retrieved 16 June 2017. ^ "Alonso says he could have finished fifth". The Times of India. Agence France-Presse. 8 September 2014. Archived from the original on 10 September 2014. Retrieved 16 June 2017. ^ Benson, Andrew (7 September 2014). "Italian GP: Fernando Alonso not expecting Ferrari improvement". BBC Sport. Archived from the original on 16 June 2017. Retrieved 16 June 2017. ^ a b c Anderson, Ben (7 September 2014). "Italian GP: Valtteri Bottas unsure over Kevin Magnussen penalty". Autosport. Archived from the original on 4 October 2014. Retrieved 16 June 2017. ^ "Daniel Ricciardo reveals how he took down Sebastian Vettel with expert passing move at Italian GP". Fox Sports Australia. 9 September 2014. Archived from the original on 16 June 2017. Retrieved 16 June 2017. ^ a b "Italy 2014 - Championship • STATS F1". www.statsf1.com. Retrieved 18 March 2019. This page was last edited on 8 April 2019, at 18:22 (UTC).